Number of generic manufacturers in the market. It begs the question of why those last few manufacturers get into the market. I am curious as to your thoughts about the introduction of high cost brands going generic and their impact on generic price inflation. Think about the chart above and Aricept. 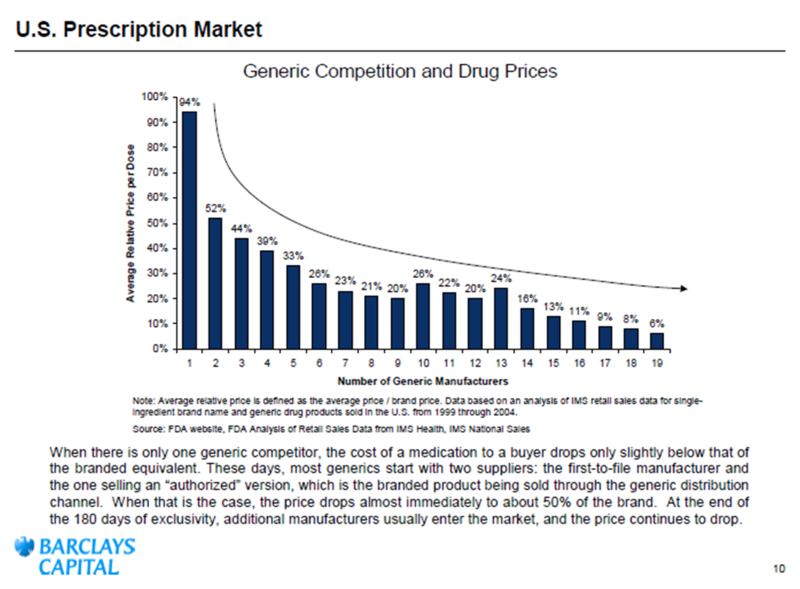 Generic price inflation has been under 1%, however, there are a significant # of products converting over the next couple of years that should drive the avg Generic cost/Rx up significantly..Aricept, Lipitor, Lovenox, Advair, Seroquel, Zyprexa, etc..With the increased FDA scrutiny, plant closings, API shortages etc these all could lead to Generic INFLATION vs the general deflation we have seen over the years. I look forward to your thoughts. FYI, these data come from a 2005 (!) study by the FDA. While I suspect the curve may be even steeper now, there has also been substantial consolidation among manufacturers. I’m curious to see some more recent numbers.